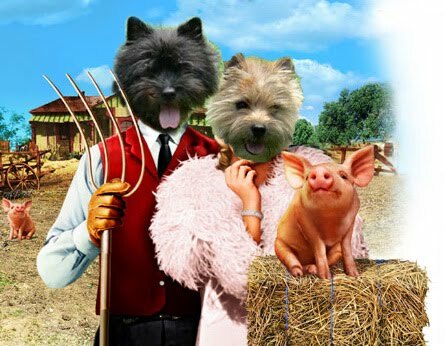 Dress in your farm clothes or in your New York finest and join us for our annual Cairn Terrier specialty in Long Beach, California, June 25, 26 and 27. The Cairn Terrier Club of Southern California will hold its annual specialty on June 25. Supported entries will be held on June 26 and 27 for the two Great Western Terrier Association shows. We’ll host the event with both lunch and dinner on the grounds near the Queen Mary on Friday, June 25, at a very affordable cost to all. This year we will have both puppy and veteran sweepstakes all three days – Friday, Saturday and Sunday. The trophies have arrived and the committee is working on the farm décor! Donations to our trophy fund are very much appreciated. Donations can be made payable to CTCSC, and sent to Dennis Broderick, 4328 W 164th St., Lawndale, CA 90260. If you have an item to donate for the raffle, please contact Carol Roemer. If anyone knows of someone who has not attended our specialty in the past that they know would like to receive a premium list and specialty booklet, please contact Karen Smith. All contact information is available on our website at http://www.cairnterrier.net/, as are booklets and raffle information. Join us for another fabulous weekend of fun, this year down on the farm. This blog is now located at http://blog.cairnterrier.net/. I came across this letter online, and it was so eloquent in expressing the special love for Cairn Terriers in general, and the joy of rescuing a Cairn in particular, that I thought I would share it with all those who feel a lifelong bond to these special little dogs. 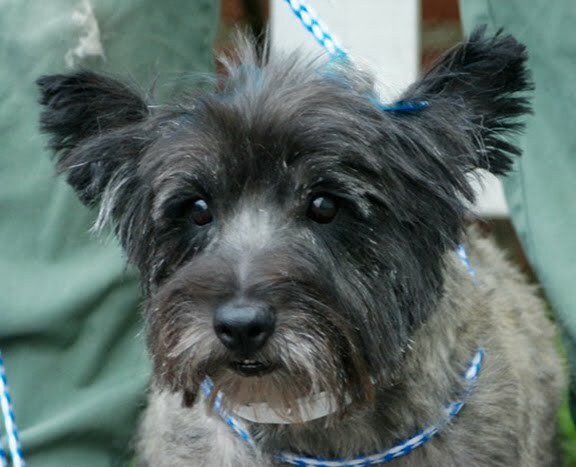 Recently, we lost our 14-year-old Cairn Terrier, and now must decide whether at our age if we should get another dog. I remember when we got Maggie (that was her name) I wondered if I would outlive her, and now the odds have changed considerably. Even so, we have a daughter and son who both love dogs so it could be part of their inheritance. The next question was what to get, and because we had enjoyed the peculiarities of Cairns, we decided to get another. As luck would have it, our daughter found a lost Cairn in our very own animal shelter, and to make certain we got on the ball, she said they were going to put it down tomorrow. We called immediately and found out they open at 9 a.m., so we were there at 8 just in case they might have a fast clock. They were very busy and suggested we go into a back storage room and see if we could find the dog we were looking for. It was a large room with dozens of dog cages stacked on top of each other all the way to the ceiling and each one had a very unhappy dog in it barking for attention. However, by chance I happened to notice one way off in a corner on the floor and in it was a small dog not barking but standing on its hind legs and reaching up as far as it possibly could to me as if saying, “please pick me up and take me home,” so I did. As to whether it was a true Cairn or not didn’t really matter, but if you saw her running across a field you would have sworn she was a fox. The process of getting a dog from the shelter includes them insisting the animal be checked for heart worms and have current shots, plus be spayed. I was very impressed with these people, for they are kind and gentle with the animals in spite of there being so many of them, and I can only imagine how difficult it must be when they have to put some down. Of course we loved Maggie but can’t help to compare the two, especially their temperament and personalities. Maggie’s charm was to let us pet and love her; but the new dog had been neglected for so long it begs to be loved and held. Also Maggie would only go to the door if it was a stranger, but Ginger (that is our new dog’s name) is always there wagging her tail and glad to see me. Of course we all brag on our children and how smart they are, so I want to tell you Ginger already knows “walk,” “bye-bye,” “yum yum,” and I am desperately working on “potty.” As you are aware, we have no regrets as a result of getting our dog from the shelter and find it interesting that I don’t know which gives me the greatest pleasure, the love our dog gives us, or the fun of loving her. Who knows, your new best friend might be down there right now hoping you will come before its time runs out. P.S. They have cats too.